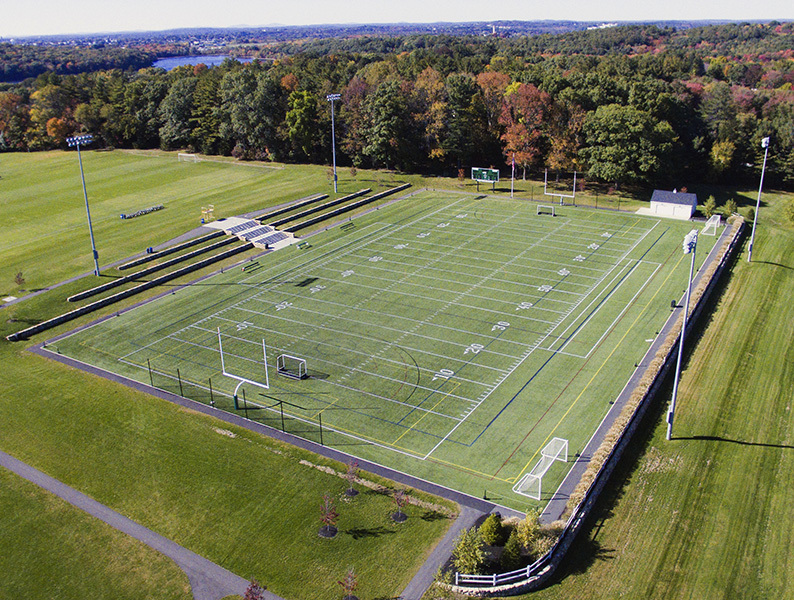 Huntress Sports provided design, engineering, permitting and construction administration services for the development of a new $1.5m multi-purpose athletic field at Brooks School in North Andover. The client desired a new synthetic turf field, 1000 'seats' for spectators, sports lighting and storage building, however remained hopeful that the new facility respect the rural aesthetic character of their rolling New England landscape and campus setting. The design team worked hard to provide a state-of-the-art synthetic turf field surrounded by natural stone walls providing terraced landscape seating, native plantings, and a saltbox style storage building which fit beautifully against the hardwood forest. The facility serves as a center piece to the existing athletic facilities and was completed on time and within budget.